We push the blues envelope a little this month with both our Pick Hits and Surprise choices. 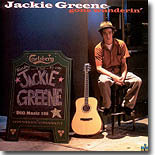 21-year-old Jackie Greene's great new CD showcases a prodigious talent that combines blues with folk, bluegrass, and old time country with youthful exuberance. This fine new CD, Gone Wanderin', is this month's Pick Hit. Veteran rock / rap producer Little Axe mixes blues with electronic music for his latest, Hard Grind, this month's Surprise pick. Mark this one on your holiday shopping list right now ... a bargain priced four-CD set of most of the great T-Bone Walker's essential recordings. Finding this one under the tree will certainly make anyone's holiday more memorable. Learn more about it in this month's Flashback section. This month's What's New section includes new releases from Blind Boys of Alabama, Luther Allison, Susan Tedeschi, Ana Popovic, Mark Wenner, Mad Dog Lester Davenport, Denise LaSalle, soul legend Eddie Floyd, Jon Cleary, and a special Christmas treat from blues / soul singer Dorothy Moore. There's also a rare collection of vintage Phoenix soul music from Eddie & Ernie.